Aluminosilicates are compounds containing oxides of both silicon and aluminum. These compounds are quite common in the earth's crust, so it is worth taking a look at a few examples. Two of the most prevalent types are phyllosilicates, with extended layered structures, and tectosilicates, with structures that extend through a three dimensional network of covalent bonds. The clay minerals are a class of layered aluminosilicates formed by weathering of other silicate minerals. You are probably familiar with clay in some form or other. It is much finer-grained than sand, which is another product of weathering that is commonly found in the soil or exposed at beaches. Unlike sand,clay can sometimes be formed into shapes. We will take a look at two important examples. The first example, kaolinite, is the major component of kaolin, a clay that is heavily used in making "china" and other ceramics. It is usually white but small amounts of iron can make it pink, yellow or orange. 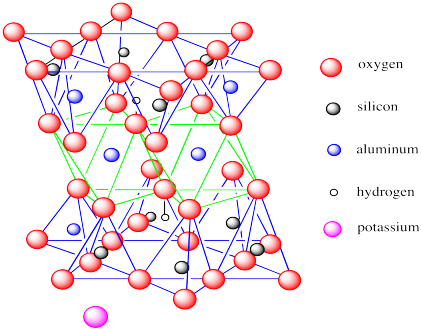 Kaolin contains hexagonally arrayed layers of silicate tetrahedra, as we have seen in other phyllosilicates. 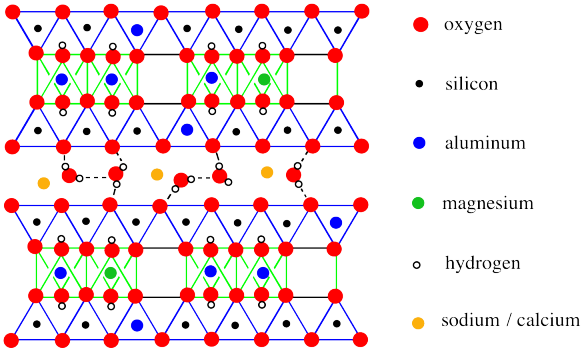 The difference is that this layer sits on top of a layer of aluminate octahedra, with some of the oxygens shared between the two layers. In the picture below, the lines are meant to reinforce the idea of the geometries involved: tetrahedra are outlined in blue and octahedra are outlined in green. The bonds between silicon and oxygen are not shown, nor are the bonds between aluminum and oxygen. We have shown the tetrahedra on top and the octahedra below but there really is no top or bottom to the layer, so it can just as easily be drawn the other way around. Kaolinite is an example of what is sometimes called a 1:1 clay mineral or a T-O clay mineral. These designations convey the idea that there is one tetrahedral layer and one octahedral layer bonded together by shared oxygen atoms. If you take a look at the structure, you will see that some of the oxygen atoms are bonded to hydrogens; they are hydroxides. These hydroxides play an important role in the long-range structure of kaolin. In the picture below, we have simplified the structural drawing to a cartoon. We have also expanded the view to see cross sections of two phyllosilicate sheets and to see a little bit further down each sheet. In the drawing, the basal layer of hydroxides (that's the layer of OH groups on the bottom face of a sheet) interacts with the basal layer of oxides on the next sheet (that's the layer of oxides on the top of the sheet). These sheets are held together via hydrogen bonding. Of course, there are more sheets than that. You could easily picture a third layer above the ones that are shown, with its basal hydroxides hydrogen bonding with the oxygens of the tetrahedral layer on top of the drawing. The other feature that is apparent in this drawing is that the long-range structure of the layer varies a little bit. Some of the octahedra are missing. Only 2/3 of the possible sites in the octahedral are actually occupied, although they are not necessarily spaced out evenly like in the drawing. There are other clay minerals that don't have these absences, although we aren't going to look at any here. One of the unique features in kaolinite is an electrically neutral layer. If we were to consider all of the oxygens to be O2-, with the cations Si4+, Al3+ or H+ based on the positions of these atoms in the perioidc table, then the positive and negative charges would exactly balance each other. That contrasts with what we will see in the other cases that we will look at. Kaolinite has a general formula Al2Si2O5(OH)4. Show that kaolinite is electronically neutral overall. Montmorillonite is an example of another type of clay mineral. It is important as a soil additive in gardens because it helps with moisture retention. It is also used in the petroleum industry when drilling for oil; a slurry of montmorillonite in water helps keep the drill bit cool. The structure, shown below, has a lot in common with kaolinite. However, there are some key differences. Monmorillonite is a 2:1 clay mineral or a T-O-T clay mineral. Its octahedral layer is sandwiched between two tetrahedral layers. Also, there are fewer hydroxide groups in monmorillonite than in kaolinite; both basal layers are oxides, with hydroxides being found only in the interior of the layer. Finally, montmorillonite does not form electrically neutral layers. The layer is overall anionic, requiring counterions to balance out the charge. These ions are usually Na+, but also include Ca2+. 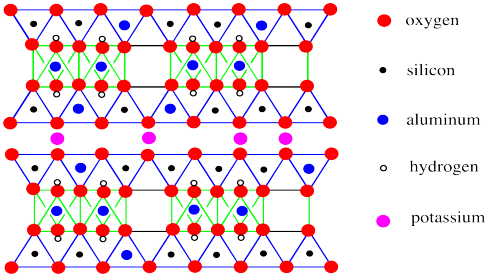 A more extended view of monmorillonite once again reveals the absence of a third of the aluminate octahedra, as well as some other, subtle differences. The most obvious difference is the presence of water molecules between the layers. That difference is a key feature of montmorillonite's properties. However, the long-term structure also reveals occasional substitutions, in which a magnesium has replaced an aluminum in an octahedral site, or an aluminum has replaced a silicon in a tetrahedral site. The moisture-retaining ability of montmorillonite is related to the cushion of water molecules between the layers of the material. More water can always be allowed in. Predict the effect of the following substitutions on the charge of a montmorillonite sheet. a) A silicon is replaced by an aluminum. b) An aluminum is replaced by a magnesium. Potters and ceramicists typically wouldn't use montmorillonite clay in their work. Explain why. Micas provide additional examples of phllosilicates. The most common form of mica is muscovite, which at one time was used in Russian windows. It has a very distinctive appearance, forming blocks that can be peeled apart into thin, solid sheets of transparent material. Muscovite is not a clay mineral. It does not form from weathering of other rocks. However, it clearly has some structural similarities to clay minerals, especially to montmorillonite. Like montmorillonite, muscovite sheets contain octahedral layers sandwiched between tetrahedral layers. 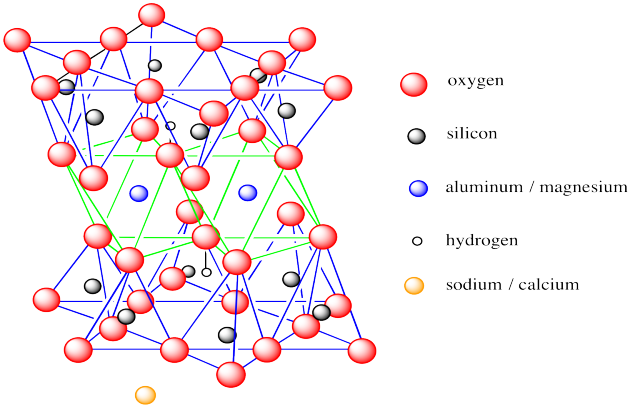 Also, there are some substitutions of aluminum for silicon in the tetrahedral layer. A striking difference between montmorillonite and muscovite is the absence of water molecules between layers in the mica. Instead, the space between the sheets is occupied only by potassium ions. What interaction holds the sheets of muscovite together? How is the structure of muscovite related to the physical appearance of the mineral? Once again, tectosilicate structures get very complicated and we will only look at them briefly. One of the most common groups of aluminosilicates is the feldspars. They are thought to make up about 50% of the earth's crust. Feldspars, like silica, have extended three-dimensional structures. However, like silica, we can see some patterns emerging by following individual chains of tetrahedra through the structure. In silica, we saw spirals or helices; in feldspars, we see zig-zags instead. Feldspars are significantly different from silica because of frequent substitution of aluminum for silicon and because their structures contain counterions. These counterions are frequently potassium, sodium or calcium. a) albite, the sodium endmember. b) anorthite, the calcium endmember. Feldspars are the most common class of tectosilicates, but one of the most interesting classes is the zeolites. Zeolites are tremendously unique and useful materials. They are characterized by a great capacity for storing gases and small molecules. In fact, the name zeolite translates from the Greek to mean "boiling stones", because they may give off steam when heated. Zeolites are also used in catalysis in the petroleum industry, helping to convert petroleum distillates into more useful forms. The reason zeolites are able to store small molecules is directly tied to their very porous, cage-like structure. In order to emphasize that feature, zeolites are frequently drawn as octahedral line drawings. The following sketch shows the structure of a faujasite, a naturally-occurring zeolite that is also made synthetically for industrial purposes. The structure is truncated; it would extend further through the attachment of similar units in different directions. However, this view lets us see some key features. A large cavity is clearly seen in the middle of the structure. In addition, there are smaller cavities inside the hexagonal "globes" on the corners, as well as tunnels through the hexagonal "drums" connecting the globes. 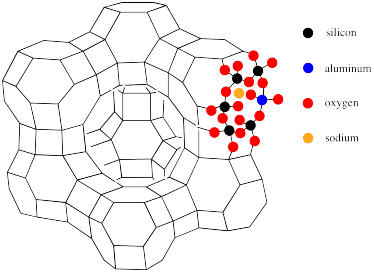 The hexagons themselves are really pore-like openings into the interior of the zeolite. 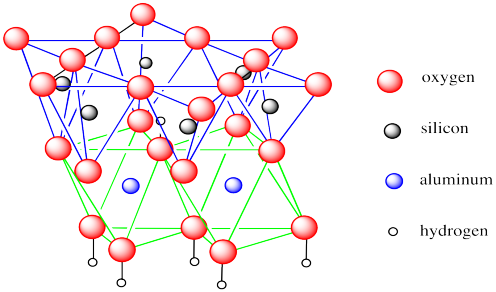 The connection between this polyhedral structure and the atomic makeup of faujasite is illustrated below. There, the atoms around one of the hexagonal pores have been filled in. 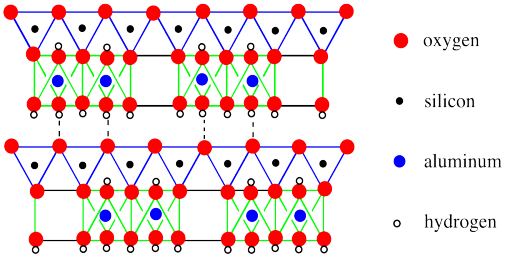 Each vertex or corner of the structure represents a silicon. However, aluminum can substitute in for silicon to varying degrees. 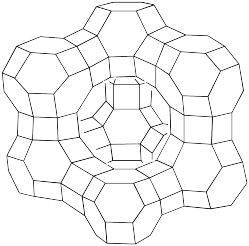 along each line in the polyhedral drawing there is an oxygen atom. Thus, the hexagonal pores in the drawing are really rings formed by twelve atoms, not six: six silicons (or aluminums) and six oxygens. Also illustrated in this picture is the anionic nature of the zeolite framework, necessitating the presence of counterions such as sodium. Zeolites are useful because molecules can be stored inside of them. Also, molecules can be made to react with each other while trapped inside a zeolite at high temperature. Researchers are very interested in making new architectures of zeolites, and in modifing them to contain catalytic sites that will carry out important reactions.